The Laura Fergusson Trust (Wellington) is very proactive in encouraging training. Thanks to a Careerforce work based training programme supported by the Trust, Haley was the first in the organisation to complete a New Zealand Certificate in cleaning (Level 3) Supervision Strand. Now she is embarking on a New Zealand Diploma in Business (Levels 5) Leadership and Management qualification, that could take her one step closer to management. Haley’s employer, Laura Fergusson Trust (Wellington) is an independent, charitable trust that provides opportunities for people with disabilities to pursue a supported and independent lifestyle. The Laura Fergusson Trust (Wellington) has recognised Haley’s capability and suggested that she embark on the Level 5 Business qualification. Careerforce Business Development Consultant, Mark Wootton, looked at what Haley was doing and going to be doing, and the level 5 fitted well. He felt that it might help her to grow and develop her role. 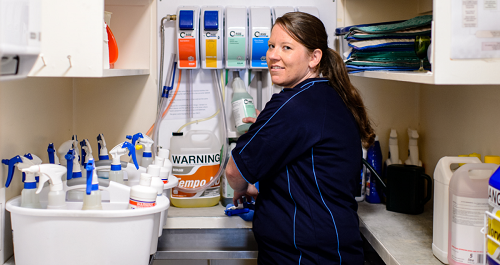 “Working as a cleaner at the Laura Fergusson Trust (Wellington), the most important thing for me is that I can walk away and feel like I’ve made a difference to the residents.